The Jordanian departure procedure was straightforward enough, and soon I was on the fast ferry to Nuweiba on the Sinai peninsula. I’d heard horror stories about the customs procedure when entering Egypt, expecting anywhere from 4 to 7 hours of filling forms, waiting in lines, filling more forms, handing over money, etc. With my loins thus girded, I entered the fray expecting the worst. Within a few minutes I was approached by a uniformed member of the Tourist Police, who guided me through the ordeal. All of the forms and window signs were in Arabic, and all information was recorded longhand in huge antiquated ledgers. I signed forms, handed over sums of money, signed more forms, and finally attached a temporary Egyptian license plate to the bike. Finally a senior guy with lots of stripes and stars on his epaulettes took a cursory peek inside my luggage and sent me on my way. 45 minutes! This is the secret to maintaining sanity during uncertain border crossings: Smile and be polite, expect the worst, then be pleasantly surprised when it all somehow goes smoothly. 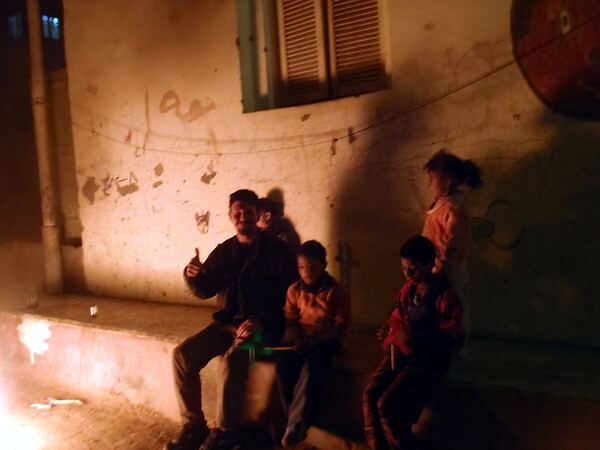 Protests were already underway when I set foot on Egyptian soil, so the short term plan was to hunker down in the quiet diving/loafing resort village of Dahab to see what would develop. Escape plans included fleeing north to Israel, or backtracking to Jordan (which soon had its own protests underway). The road to Dahab snaked through hills of jagged granite shot through with volcanic dikes, and with the help of a local found the hotel that I would call home for the next two weeks. 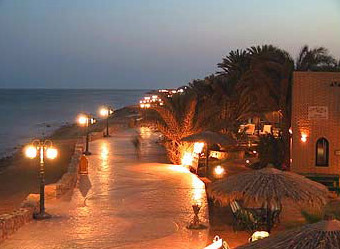 View of Dahab. Not my photo. Used without permission. Dahab was virtually free of tourists, and I passed the days devouring books, inspecting the distant hills in Saudi Arabia across the gulf, and sampling the local milkshakes (the best are at the restaurant called Same Same…but the food is nothing special.) On the second day I met Lasse and Chris again, and it was a relief to have company for swapping books and travel stories. 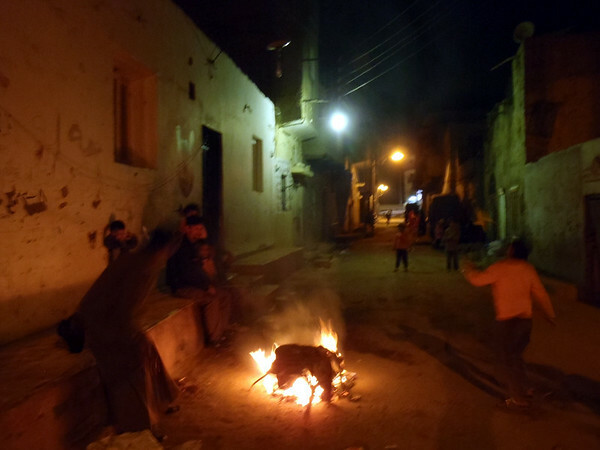 Locals were glued to televisions, and other than interrupted ATM and internet service, things remained quiet. Lasse, Chris and I hypothesized on the outcome of the uprising, and over the course of our free time discussed politics from our own countries, books, movies, Lasse’s time in the Danish navy as a submariner, their rock climbing adventures, Chris’ future plans as an archaeologist, and what life would be like when we returned to our respective homelands. January 25th arrived with a “Day of Revolt” in Cairo, and out went the internet, and soon the ATMs dried up their supply of Egyptian pounds. Small potatoes compared to the folks in Cairo, Alexandria and Suez, whose protests targeted Mubarak’s 30-year regime, police abuses, low minimum wages, and government corruption. [Mubarak’s regime also included 30 years of emergency law, under which constitutional rights were suspended, police powers expanded, censorship legalized, and imprisonment without cause was allowed. ] 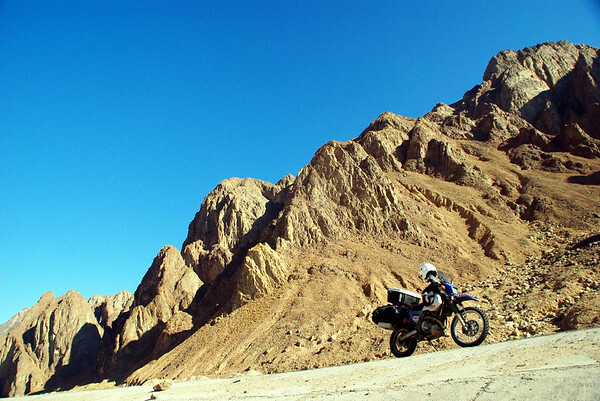 After 10 days, Lasse and Chris grabbed a taxi north to the Israeli border, and I made tentative plans to ride to Aswan via Sharm El Sheik, Suez, Luxor. After filling up with fuel, water and a few day’s worth of food, I set out down the coast to Sharm, hung a right and continued up the coast of the Sinai to Suez. 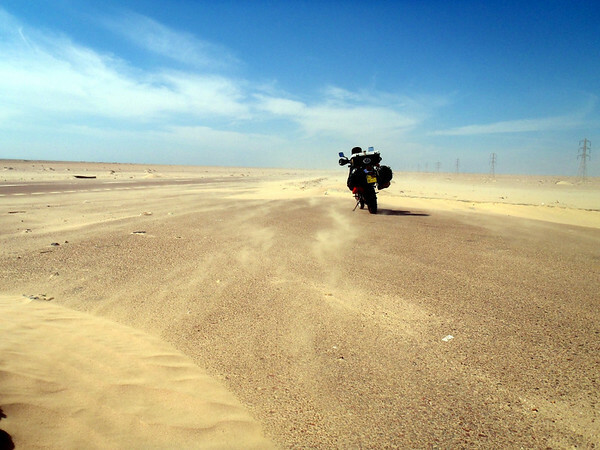 Windy day on the road in the Sinai. Windblown sand partially covers the highway. Before crossing under that famed canal, I underwent a thorough search of my luggage, including a pass with a wand over me and a furry canine officer to sniff the bike. I was asked twice to show all of the photos on my camera and computer. The military were thorough but polite, even apologetic. In Suez I had my first glimpse of riot carnage, tanks and APC in the streets, and decided not to linger for a photo op of cargo ships passing through the canal. I went further south along the coast and holed up in Hurghada for the night. 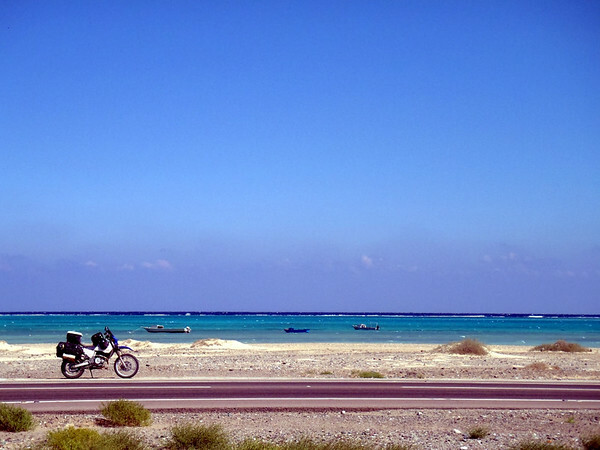 Riding the Red Sea coastal road. I turned inland/west at Safaga (after being denied 80km south at Quseir) and quickly climbed from sea level into cooler, rocky mountains. Inland road between Safaga and Luxor. In Luxor I found lodging at the Oasis hotel, a drab, concrete budget option with excellent friendly staff, clean rooms and secure parking for the moto (accessible by walking/clutching the bike up a few steps and through the lobby — another reason to have a light bike with good ground clearance). 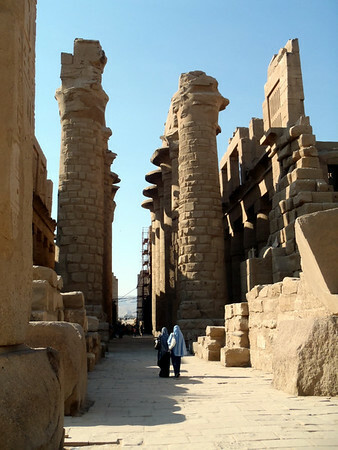 Luxor (ancient Thebes) is home to the Karnak Temple complex (link to background info, opens in new window), and I found a taxi driver and negotiated a price for him to drop me there, wait for an hour and drive me back to the hotel. (In retrospect, I could have easily burned two hours there.) 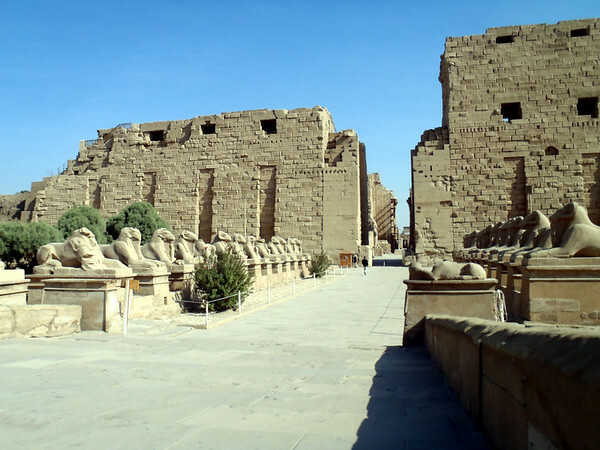 Karnak was deserted, save for a few Egyptian tourists and a babbling, giggling group of school kids. The day’s English lesson must have been “Hello! What’s your name?” because each one of the three dozen of them asked me as they passed. Entrance to the temple of Amun-Re. 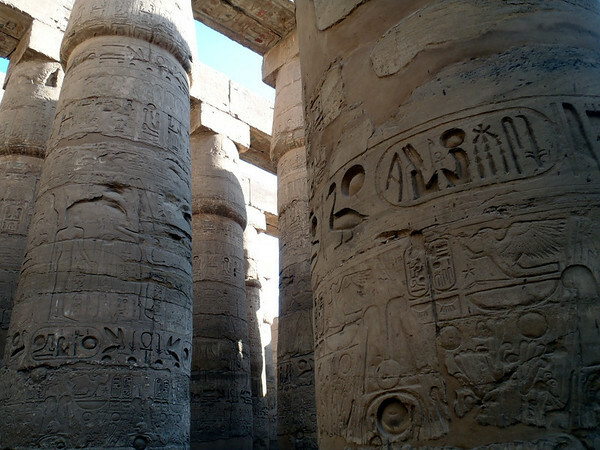 Columns in the great hypostyle hall. Column details. These massive sandstone columns measure 18 meters in height, 21 including the "abacus" (recangular cap stones). Not only is this a mindblowing feat of artwork and engineering, but all of the sandstone raw materials came from 100 miles south of the site! When my hour was up (I may have stretched it to 1:15), I found my taxi driver, who asked me to come by his “corner” where he and his brother, cousins and friends hang out during off hours. With nothing else planned for the day I went along, and for a while we sat in plastic chairs, chatted, smoked (no hashish for me, thanks fellas), and watched traffic pass by. 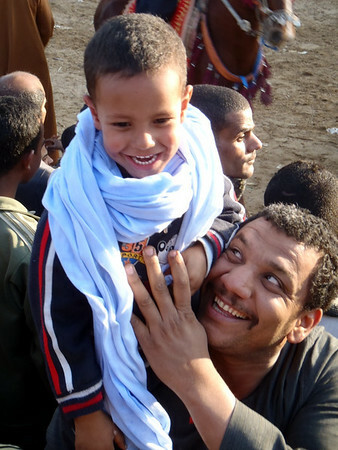 One passing taxi driver shouted, “Hey, a tourist!” — such was the dearth of visitors in all of Egypt. My driver Ahmed mentioned that there would be celebrations for the birthday of prophet Mohammed, and today would be the final day of the week long event. Would I like to go? Sure! So five of us crammed in to his Hyundai taxi and made for the fairgrounds near the airport. Lots of folks were going — packed into pickup truck beds and tractor- and donkey-powered carts, riding 2, 3 and 4 up on scooters and small Chinese motorbikes, all driving like the usual Egyptian madmen. We somehow found a place to park and squeezed through the crowd to find a good vantage point atop a donkey cart with a dozen others. 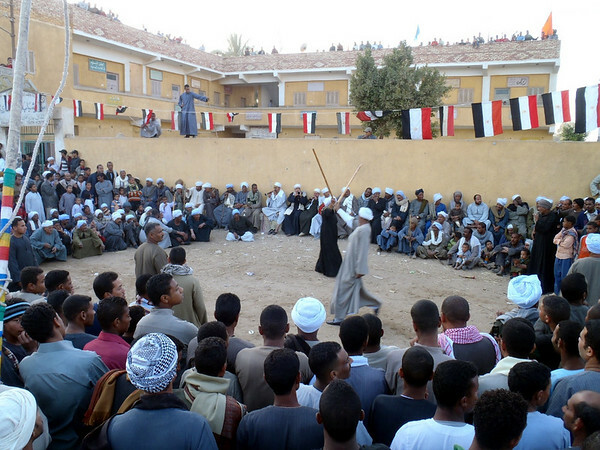 Crowded celebrations for the prophet's birthday. Our cart was occasionally rocked by the attached donkey, who was having irrestible amorous urges to mount another nearby donkey. 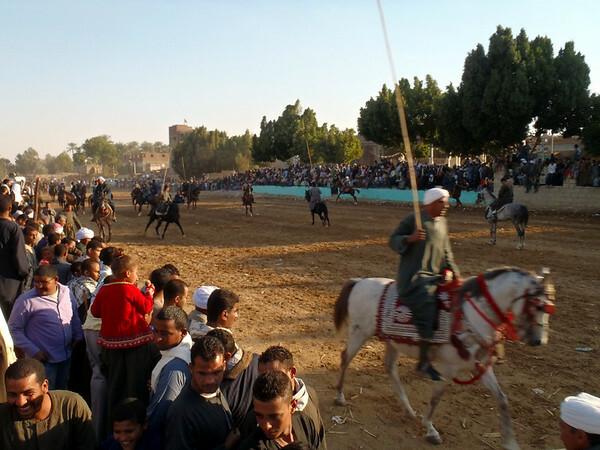 Lots of guys were dashing around on horses and camels, shouting and swinging around long wooden poles. There were a few impromptu drag races, and soon enough, out come the firearms. Everybody loves celebrational gunfire. Off-camera, someone unloaded a magazine in full auto. Good times! Fun for all ages. Kids loved to try out their English on the only pale face in the crowd. 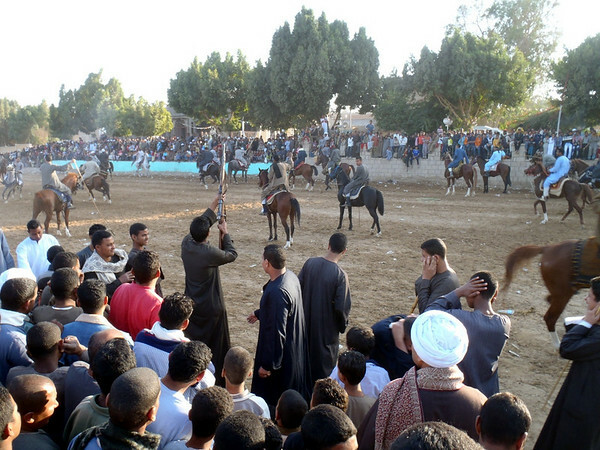 In a nearby circle, guys would go through the motions of a sword fight with wooden poles. Ritual swordfight in slow motion. We found the taxi again and crept out of the chaotic parking area as dusk settled on the scene. Heading back into town, everyone convinced me to stick around and have dinner. Sure! We parked back at our “corner” and walked through back streets to a street market area, found a small, humble restaurant and seemed to have one of everything. I took my cues from the other fellas and just dug in, eating with my fingers (right hand only, please) and when a dish was emptied, it was replaced with a full one. Fresh crunchy falafel balls, brown beans, tajine, kofta (tasty meatballs), pickled vegetables, and warm flat bread. Delicious and about as authentic as it gets. We walked on through the street market, someone handed me an orange, and we sat down at a table loaded with tomatoes and got down to the business of serious people watching. Ahmed’s brother asked me to sell something, since I was behind a table. I put my free orange on display and said, “Good price for you! Egyptian price, not tourist price!” (Anyone who has been a tourist in Egypt will know why this was appropriate.) I got a few laughs but no buyers. Our butts soon got tired of sitting on chicken crates so we headed further into the back streets to where Ahmed, his brothers and friends grew up. Horses stood idle nearby, free from their carriages, and cats pawed through trash piles for nutritional scraps. Scrap wood and plastic was gathered for a small but symbolic fire. Nothing cements a social scene like a fire. Local dudes drifted through and stopped to chat and meet the tourist. Children came out of the woodwork to see what was up. Making friends around the fire. Eventually when the fire died down we walked back to the corner. I said my farewells to Ahmed’s brother and cousins and friends, and he drove me back to the Oasis. I hadn’t given him any money all day, and what started as a quick trip to Karnak turned into a 7 hour tour of everyday Egypt. Instead of haggling, he just handed me his wallet and said, “Here is my empty wallet…please fill it!” I did, probably with a bit too much, but for me there is more where that came from, for him, with no tourists in town for the foreseeable future, I wasn’t so sure. He wished me luck for the rest of my journey, and I thanked him for the unexpected and memorable time.